This is our favorite of all of the healthy salad recipes we've tried. 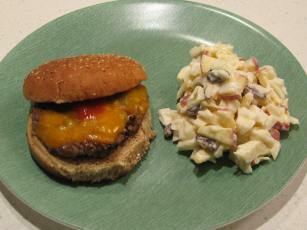 Shown here with a burger. 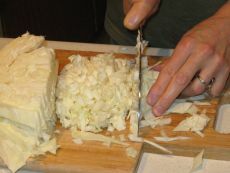 Start by cutting your cabbage into small pieces. Then cut your bananas into small half moons by first cutting the long way and then making them into little slices. The apples are done in a similar way by cutting into eighths, coring, and then making into slices. 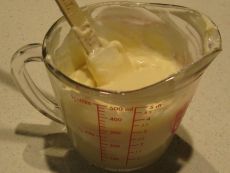 Measure out and mix together your Miracle Whip, sugar, and milk. Put the mixture into a bowl that is big enough to hold all of your ingredients. 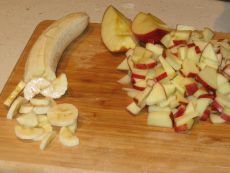 Add your bananas and apples to the bowl first so that they are covered with the sauce. This helps to keep them from becoming brown. 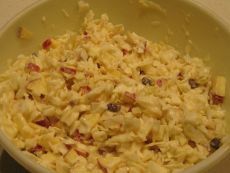 Finish up by putting in the cabbage and raisins. Stir all of the ingredients together well. This easy salad recipe is also good the next day, so be sure that you have some leftovers!